Still the hospital was an army target. While under fire from the Israeli military on Thursday, hospital director Basman Alashi communicated with the army via a delegate from the International Committee for the Red Cross (ICRC). The military said that they were not only going to shell the facility, but that it would be fired upon so heavily that they recommended all people in the hospital evacuate. The ICRC attempted to coordinate the evacuation, relaying messages from the IDF in two phone calls made to el-Wafa’s hospital director during the shelling. The first call from an ICRC delegate to Alashi was after 9:30 pm, an hour past when the army had already initiated fire on el-Wafa. In that call the delegate asked Alashi how much time he needed to evacuate and he told her two hours. But an hour later when the ICRC delegate phoned for a second time, staff was already abandoning the building under duress. The blasts from the artillery shells had cut the hospital’s power and destroyed the second and third floor. Smoke was filling into the patients’s rooms due to a fire sparked by the strikes. 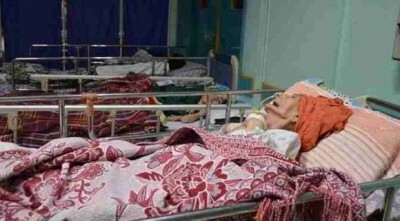 At the time of the evacuation there were two internationals also inside of el-Wafa hospital. Rina Andolini from the United Kingdom said she was in contact with the same delegate that coordinated with Alashi no less than five times that evening. The ICRC and the IDF were reached for comment on Alashi’s timeline. Both confirmed they were in communication to coordinate a humanitarian evacuation but said the contents of their conversations were confidential. The ICRC was unable to confirm their conversation with Andolini, but Andolini did provide me with the phone number of the ICRC staff she communicated with in Gaza. I spoke to the ICRC delegate in question and she was unable to comment, directing me back to her organization’s communications department. It is not uncommon in times of warfare for the ICRC to secure the transfer of good and protected persons. “I’m not belittling Red Cross’s efforts, they are the delegate, they are the middlemen, they are trying to save lives on both sides,” said Alashi when I followed up with him today. According to International Humanitarian Law (IHL) hospitals are protected sites. Article 19 of the Fourth Geneva Convention also states: “The protection to which civilian hospitals are entitled shall not cease unless they are used to commit…acts harmful to the enemy.” The Geneva Convention also requires “a reasonable time limit,” for allowing an evacuation. If a hospital is used to launch weapons, under IHL it can only be targeted when there is an imminent strike originating from the location. Even storing caches of weapons do not meet international law’s stringent threshold for firing on humanitarian sites. Furthermore, on July 11, 2014 the army fired five missiles at el-Wafa, taking out part of the hospital’s fourth floor. The first blast was a smaller “warning strike,” followed by four significantly larger blasts. In that instance the IDF phoned Alashi directly the night before and told him the hospital was going to be hit with artillery shelling. A team of eight internationals then moved into the facility in hopes of protecting it from Israeli fire. The also IDF confirmed that they struck the hospital that night. After the evacuation two nights ago, el-Wafa relocated its operations to the Sahaba medical clinic where they are caring for patients in cramped quarters with limited access to medications and supplies. Before July 8, 2014 when Operation Protective Edge was launched, el-Wafa was already running at reduced levels. A bulk of their funding from the Palestinian Authority was frozen two months ago after the announcement of the unity government between West Bank-bound Fatah and Gaza-based Hamas. In fact all medical facilities in Gaza have not received the funding they expected for the past two months as it has to be transferred from the Palestinian Authority via Israeli’s central bank. As well no public medical staff has received a salary. El-Wafa tried to stock up on gas for a generator and medications, but supplies were running low throughout the Gaza strip and bank closures limited the amount of cash they had access to. After running the generator for one night, their fuel reserve were a quarter depleted. “We are trying to cope, so we can get more medications. I wouldn’t say good, but we are coping,” said Alashi today. He was in the process of preparing space to take on more patients that will be transferred from Gaza’s largest hospital al-Shifa to the space they are using inside of Sahaba clinic.